← Round up of the first week back. Here we go again. Searching to make sense of the week. Friday night. It’s time for the roundup of the week. It’s been an odd one and a reassuringly normal one all rolled in together. We headed back into blessedroutine. Son1 slowly got better from all the sickness and I remembered once more that sickness=grumpy sad children. No sickness=happy and delightful children (for some of the time at least). We enjoyed life together this week. The boys were mostly charmingly good company. We did all our normal things and we were glad. Intertwined with that lovely return to normality was the rest of the week. Husbandface’s health took a turn for the worse with him ending the week with a day off work. Depression is such a killer. There isn’t a nice neat cure, there is no way of really knowing how much to push through and how much to listen to your body not breathing properly and crashing each night. Hmm. Put like that it sounds simple. Listen to your body and stop. Put that thought in the mind of someone with crippling depression it’s suddenly not simple at all. Depression isn’t easily explained, it doesn’t look obvious like a plaster cast. It deceives the person suffering and the people around. The black dog is a suffocating menace and I wish it would leave my amazing man alone. It’s in these times that I miss our old church family with an aching heart. I miss being able to go to small group and tell people how it is and know that they care. I miss the love they showed us and I miss the safety of their love for husbandface. I miss our safety net. Life feels very vulnerable right now. It’s shot through with normality and good times but every now and again I get scared that we aren’t known as well as we used to be. It’s unsettling and strange. Not insurmountable. But I am noticing the weirdness. Leonard Cohens death today was another blow in an already pretty odd week. He was the most beautiful poet. Go read some of his lyrics and marvel at how he managed to encapsulate life, depression and cynicism so well. There are so many good lyrics but it is always the ones from ‘Anthem’ that I come back to. ‘Ring the bells that just won’t ring, forget your perfect offering, there is a crack, a crack in everything, that’s how the light gets in’. Tonight very good friends will arrive in our house and I hope for good times sharing life and the madness of small people together. It’s been a weird old week. We could do with some fun. I almost forgot. Christmas joy has started. The boys and I loved our first visit to Christmas fun at one of the many local garden centres around here. It’s the perfect thing for cold wet afternoons. 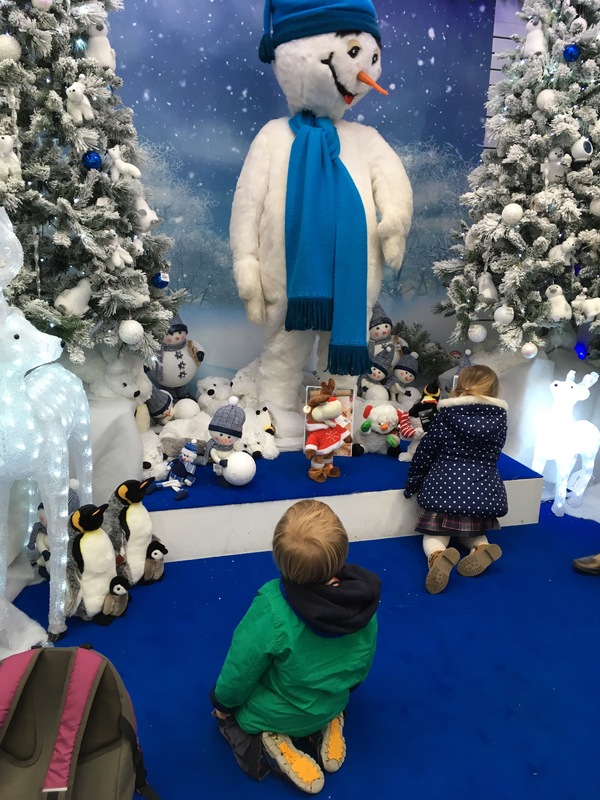 Lots of space to run around, books and toys to play with, a free light show with the Christmas lights, a moving snowman and even some animals to look at. If things get worse around here I think I’ll just dedicate these weekly roundups to a review of garden centre Christmas displays. I think there would be take up for that. Oh and one more thing. Watch Black Mirror. Now. It’s genius. Unsettling and profound. I think Charlie Brooker might just be a prophet. There is so much I want to write about it but time is too short. Blog post a brewing though so watch this space. And that’s it. Enjoy your weekend.